The arts are essential in life. They can shape and define who we are and how we understand ourselves and our possible selves. It is a travesty that in some quarters the arts in schools are increasingly regarded as unnecessary. We see dance, drama, music and visual arts as fundamental to cultural engagement and personal development. Artistic experience fuels imagination and in turn imagination fuels creativity. Within CPR’s curriculum framework, the arts are linked to creativity as one of eight essential curriculum domains – although CPR emphasises that creativity is not regarded as exclusive to the arts. The instrumental argument for the inclusion of the arts in education is that they foster transferable skills and boost overall academic achievement, leading to better future work opportunities, enhanced well-being and self-esteem. In contrast, the essentialist view, underlined in an earlier blog from Robin Alexander, is that the arts are valuable for their own sake and should not just be seen merely as tools for other kinds of learning. Elliot Eisner’s ten lessons the arts teach resonate beautifully with CPR’s aims. They propose that the arts provide space for personal judgement; help problem-posing and thinking outside the box; promote diversity, respect and intercultural understanding; show that making mistakes can be liberating and open up new opportunities; encourage looking at details and thinking in depth; allow the creation of a personal reality; provide therapeutic benefits and support emotional literacy and make us feel alive. Children don’t experience learning as separate parcels of knowledge to be opened. They flow from one form, with different ways of exploring and expressing, to another. They use what Loris Malaguzzi calls ‘100 languages’. In relation to CPRT’s values and vision, we suggest that positive connections between the arts, as well as non-arts subjects, can maximise creative learning. Although we may more commonly talk about learning in and through different art forms, the work of Lars Lindström usefully draws attention to also learning about and with the art form. These distinctions emphasise a wonderful world of possibilities for both teaching and learning. However, promoted by the DfE, the Education Endowment Foundation (EEF) Teaching and Learning Toolkit tells us that arts participation has low impact on ‘academic learning’. This worries us on two counts: firstly, the type of research approaches used to gather this evidence can never fully capture the subtle qualities of learning in the arts; secondly, it is grossly inaccurate to imply that the arts are non-academic. Also, we are deeply troubled when it is seen as perfectly acceptable to relegate the arts to extra-curricular activity, seemingly the view taken in the DfE White Paper Educational Excellence Everywhere. In any event, evidence from a much larger body of research than the single project cited by EEF shows that arts education does indeed have a positive and significant ‘academic’ impact. Our work with the South West Research Schools connects closely to four of CPRT’s priorities: community, curriculum, voice and pedagogy. These schools are fully committed to providing rich and stimulating learning experiences and recognise that the arts have much to offer in contributing to this aspiration. 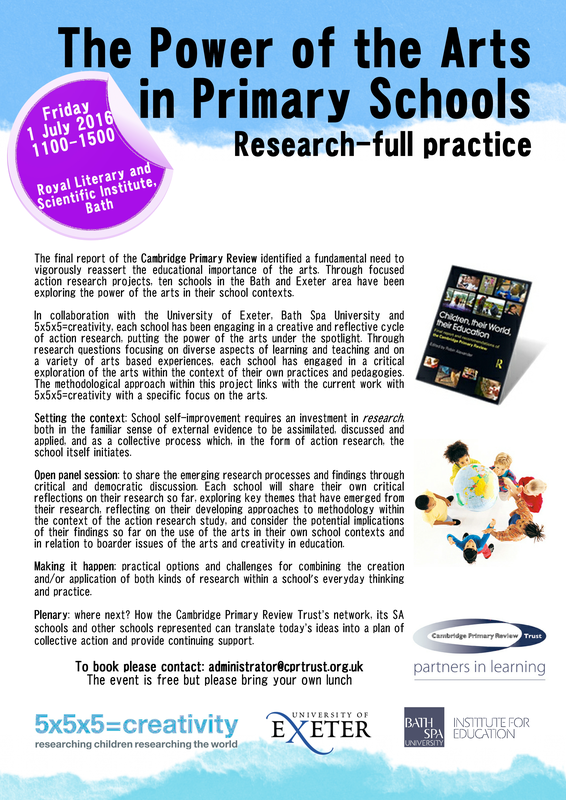 In the Power of the Arts event recently held at Bath’s Royal Literary and Scientific Institute, six of CPRT’s South West Research Schools shared their research findings to date, which led to wider discussions about teaching and learning in the arts and, more generally, a creative school ethos. Significant messages arising from the discussions underlined the importance of both teachers and children learning as researchers, and the potential of working with the ‘habits of mind’ of artists and creative professionals to develop creative learning skills. … believing in children’s ideas, with research as a habit of mind – catching learning. We became fascinated in how children’s drawings help them to put ideas together and grow – in how can ideas be revealed, connected and grow through drawing. Some important things came out from what we saw. The children’s language was more developed, their imagination had grown into a fantastical language, children were catching ideas from each other. The ideas changed because we gave children time, we gave them space to do it in, and gave them attention from a teacher who was very interested in what they were doing, showed attention by writing things down, taking photos. As teachers we need to step back and ask questions about the things that fascinate us. We saw the story unravelling – we were then interested in how we could give children the time space and attention they needed. Thank you to the primary head teachers who have generously shared their innovative approaches to learning, teaching and professional development, showing how artists and teachers work together to increase children’s self-esteem, self-confidence and independence with the vision to expand the imaginative potential of children and supporting them to become independent learners. Post Brexit, here is much healing that has to be done and what you’re doing is really important work. Artists and teachers are united by the fact that they are social beings; their actions have an impact on what happens in society and they reflect what is going on in society. The work that you, and others, are doing takes on a much broader significance and importance given that the context we are working in has changed radically. What I am interested in is practice, in what great artists and teachers do. Practice doesn’t exist in isolation but comes out of a culture. We need to engage in a process of analysis not just to document that what we do which is of value, but to collectively legitimise those practices that may appear to be marginal in order to resolve the tensions between policy expectations and practical realities, between a restricted and restrictive National Curriculum and the stuff that children immediately recognise as ‘real learning’. We need to be able to provide evidence for those practices that foster understanding, cooperation, cross-cultural perspectives and cross-disciplinary learning. 5x5x5=creativity aspires to research and support creativity in children’s learning to increase their aspirations and life skills. Partnerships between schools and cultural organisations are essential at this time, as we need to draw on our collective imagination to make a real difference to children’s lives. With determination and a growing sense of community and shared endeavour, we can together ensure that children’s experiences of primary school are enlivened and enriched by the arts. We agree with artist Bob and Roberta Smith, that ‘art makes children powerful’ and would add that it can also make teachers, as learning and research partners, powerful too. Emese Hall (University of Exeter) and Penny Hay (Bath Spa University) jointly co-ordinate CPRT’s South West regional network, which includes the South West Research Schools Network and its current focus on the arts and creativity in primary schools. Contact them here for more information. The words ‘new’ and ‘national’ in relation to the primary national curriculum are misnomers. Much is similar to my primary school education in the 1950s, when there was a relentless focus on passing the 11+. Academies, free and independent schools don’t have to follow the ‘national’ curriculum anyway, so it is not national. With a rapidly increasing number of schools jumping (before being pushed) into academy status, soon most schools won’t have to follow it. Their curriculum ‘freedom’ could enable academy chains and individual schools to create something better than the retro, imbalanced national curriculum. A balanced arts curriculum would be an improvement but currently the increasingly high stakes national assessments in maths and English are what are actually shaping what is being taught for most of each day. What children learn, and the ways they learn it, influence the development of their brains, minds and attitudes. Education with insufficient arts is a form of deprivation. I talk with teachers from many schools. I have been told, ‘We used to do drama but there just isn’t time now,’ and ‘We have been told that if we don’t have to teach something, then we mustn’t waste time on it.’ The curriculum is being shaped by fear of poor test results, with young children being overdosed on spelling, punctuation, grammar, phonics and maths. Art and design and music are at least in the national curriculum, so these subjects get some attention but drama is increasingly pushed to the wings. Drama has always been a national curriculum casualty in England, locked safely and inappropriately inside English. Even when it was slightly more prominent in the last English national curriculum, the national strategies and Ofsted ignored it. Drama is now reduced to the odd bullet-point in the programme of study for English and defined mainly by its usefulness to reading comprehension and writing. Drama has an extensive toolbox of interactive strategies and techniques that can be used to scaffold different types of thought and talk in any curriculum area. Many teachers know just two or three drama strategies and use them repeatedly, (e.g. hot-seating, freeze-frame, conscience alley). This is often a legacy from national strategies training. However, more recently trained teachers may not know any drama strategies at all and may not have had any drama training. Drama is a main artform, not just a toolbox. The Cambridge Primary Review report positioned ‘Arts and Creativity’ (including drama), at the top of its list of eight curriculum domains. Jim Rose’s ill-fated curriculum also placed drama appropriately, within ‘Understanding the Arts’, where it had equal subject status alongside art, music and dance. England used to lead the way internationally for drama in schools but no longer. Australia has its first national curriculum and dance, drama, media arts, music and visual arts have equal curriculum subject status within it. Ontario has had a statutory arts curriculum in its primary schools for almost a decade. Indeed, the Canadian Prime Minister, Justin Trudeau was once a drama teacher. Ironically, Shakespeare’s 400th anniversary coincides with drama in schools being diminished. England’s national curriculum has no programme of study or even appendix for drama, yet former Education Secretary Michael Gove agreed that all schools should receive a free copy of the Royal Shakespeare Company Toolkit for primary teachers. The press heralded his support for annual ‘Shakespeare Week’, but schools need a drama curriculum that has been fully consulted on, not just a free handbook about teaching Shakespeare and a ‘bolt-on’ Shakespeare Week. For not a single question about drama was included in the national curriculum consultation. No DfE official was given responsibility for drama. Subject expert groups were set up, but none for drama, and the subject expert group for English invited a National Theatre representative to join but no representative from the professional drama teachers’ associations. Creative and cultural industry representatives were given prominence in the developing educational landscape, and DfE consulted the relatively new Cultural Learning Alliance (CLA) rather than arts teachers’ professional organisations such as National Drama. Schools certainly should provide opportunities for children to work with artists and visit galleries, museums and theatres as part of their planned curriculum but these experiences and opportunities are no substitute for regular curriculum arts teaching in schools by qualified teachers with arts training. Meanwhile, in some academies there are teachers without qualified teacher status (QTS). At least this development benefits artists as contributors to the teaching workforce. Ofsted inspectors take account of pupils’ cultural development, including their willingness to participate in artistic, musical, sporting and other cultural opportunities. Inspectors expect schools to provide a broad and balanced curriculum and extra-curricular opportunities that extend pupils’ knowledge, understanding and skills in a range of artistic, creative and sporting activities. The arts must not be become an out-of-school-hours activity. Children need arts as part of a broad and balanced curriculum in school time and that should include art, music, dance and drama. It is just over a year since the introduction of computing as a named subject within England’s National Curriculum. While research exploring schools’ experience of this change will no doubt be forthcoming, it seems timely to reflect on opportunities that may be missed through this re-working of technology in the curriculum. Like others I was frustrated by the idea of children in Key Stage 2 being taught to create PowerPoints (an example often used to deride the old ICT curriculum) when many were already using digital technology in far more sophisticated ways outside school. Like others I’m excited by the work being done to support children to code, demystifying skills that had seemed the preserve of the few and equipping them to engage in all kinds of creative and exploratory activities. What concerns me though is that the enthusiasm for programming – and the training, expenditure and resources associated with it – may detract from issues and questions that are equally or perhaps even more important in a digital age. I take a broad look at such issues and questions in a report commissioned by the Cambridge Primary Review Trust which will be published in the new year: The Digital Age and its Implications for Learning and Teaching in the Primary School. Part 1 of the report summarises research related to how we use digital technology in everyday life, including how it is used by children, and identifies challenges and opportunities facing primary education. Recognising that children’s experiences are often uneven, it proposes that we need to do far more than equip children with skills or knowledge, whether these are the ‘matters, skills and processes’ associated with the computing curriculum or with frameworks such as Go On UK’s Basic Digital Skills Framework. The report proposes that we need to consider cultural, social, creative, ethical, and civic questions and explore technology use in relation to fundamental debates about how we see education and the role of schools. This involves thinking about technology in relation to things that have long been priorities in many primary schools and indeed the Cambridge Primary Review Trust: pedagogy, social justice, relationships, creativity, community. Part 2 explores how research is shaping ideas about how schools respond to these challenges and opportunities, while Part 3 proposes implications for policy-makers and education leaders, and recommendations for schools and teachers. Research is considered in terms of five broad ‘traditions’ representing different perspectives on how schools might take account of the digital age. These traditions include: technology across the curriculum; 21st century skills; computer science; participation, learning and digital media; and new literacies. The point here is that different kinds of research (often involving different communities of educationalists and researchers) are generating different kinds of insights and there is a need to explore how these different traditions, whose aims are sometimes complementary and sometimes not, intersect. There isn’t space here to explore all five traditions discussed in my review. However, considering the contribution of one of these – new literacies – illustrates some ways in which our response to the digital age needs to go beyond the computing curriculum as specifed by DfE. Literacy in everyday life is commonly understood to be changing rapidly and researchers in the field of new literacies are helping to describe these changes and explore implications for literacy in schools. More than ever, people produce as well as access texts, negotiating their lives online. These literacies are multimodal, incorporating images, moving images and hyperlinks, for example, and increasingly mobile as people keep in touch with others and search for information on the move. And then of course there are all the associated concerns about personal and financial security, state supervision and use of social media by sexual predators and terrorist groups. Thinking about how technology intersects with social, cultural, political and economic activity has never been more pressing. And in the light of this, never has it been more important for children to be able to navigate digital resources creatively and critically, to consider how to put them to use, and review what others’ uses mean for what they might or are able to do. Creative, cultural, critical dimensions are also relevant to lots of the activities taking place during computing lessons. In many schools children are using programs like Scratch and Kodu to create animations and games. This process involves thinking about aesthetics, coherence and how players or viewers will interact with what they produce. These are things that researchers and practitioners in the field of new literacies have long argued should be part of literacy provision. An expanded literacy curriculum would recognise the wide range of media that children use and encounter, and the diverse literacy practices in which they do and could engage in their current and future lives. And yet English in the national curriculum includes no explicit references to digital media at all. Schools are of course free to interpret programmes of study as they choose and many integrate film, computer games, social media and so on in innovative ways, and of course the ‘digital literacy’ element of computing goes some way to addressing these issues. However, as I explore with Becky Parry and Guy Merchant in a new book Literacy, Media, Technology: past, present, future (Bloomsbury, forthcoming) much of this is hindered by a curriculum, accountability framework and testing arrangements that do not appear to value the mobile, multimodal literacies that are so common in everyday life. So I applaud the new emphasis on programming but also argue that, in ensuring that all can draw on digital technologies in ways that are personally fulfilling and economically, socially and politically empowering, we need to consider how provision for digital technologies relates to the values and aspirations that underpin our wider vision for children’s learning across and beyond the curriculum. As Neil Selwyn and Kerry Facer argued in The Politics of Education and Technology technology – like everything else in education – is never neutral. Professor Cathy Burnett leads the Language and Literacy Education Research Group at Sheffield Hallam University. Her CPRT research report The Digital Age and its Implications for Learning and Teaching in the Primary School will be published early next term. From levels to performance descriptors: labelling by another name? Tim Oates, who led the ‘expert panel’ that initiated the government’s review of England’s national curriculum, was very clear as to why the old levels system had to go. Speaking in a video which was uploaded by the Department for Education to YouTube in May, he offered a set of reasons explaining why the 25-year-old levels structure was being ditched. Top of the list was what seemed a powerful thought: that summing up children’s performance numerically ran the risk of labelling them, and that this could end up harming their education. This chimed with a finding in the Cambridge Primary Review’s final report, which concluded (on page 316) that reducing children’s learning to a single level “serves to label children rather than to enlighten parents and other children about the range of their achievements”. Yet labelling children is exactly what the new national curriculum and its associated assessment, the final details of which now have emerged from the DfE, still seems likely to encourage. If anything, the new version stands to be worse than the old. And this is just one of several of Oates’s reasons for removing levels which seems not to have been addressed in the DfE’s new curriculum, assessment and accountability regime for primary schools. With the details so fundamental to school life, and therefore vital to get right, I am left marvelling again at the ability of our ultra-politicised, short-termist policy-making structure to produce something so incoherent: so demonstrably at odds even with its own stated aims. So, to expand on the point about labelling, last month the DfE set out its plans for a new system of “performance descriptors” for primary pupils. At the end of key stages 1 and 2 in reading, writing, mathematics and science, teacher assessment will see professionals giving their charges what sounds suspiciously like a level, but is not being called one. At key stage 1, in reading, writing and maths, children will be assessed as either at “mastery standard” or at “national standard”; “working towards national standard”; or “below national standard”. For key stage 2 writing, an extra performance descriptor is added to the above: “above national standard”. For the subjects of key stage 2 maths, science and reading – where, presumably, national curriculum tests will provide greater differentiation of pupil performance – and key stage 1 science, there is only one performance standard: “working at the national standard”. Surveying the above, it seems impossible to comprehend how it gets away from any problem of labelling. Indeed, in replacing, say, a child achieving level two or three in key stage 2 writing with the judgement of “below national standard”, it probably exacerbates the problem as described by Oates, in the linguistic bluntness of the description if nothing else. The single “working at national standard” – or not – verdict, where it is to be offered, also seems to invite a simple “pass/fail” judgement. This, it is hard to avoid thinking, will set up the view among many children that they are failures at an early age: from the age of seven, in the case of science. There will be arguments about the defensibility of that, but above all it is hard to see how it can be squared with the stated aim of reducing labelling. The labelling issue is probably the most glaringly contradictory output of this process, when set against the original rationale for removing levels. But other aspects of the vision, as set out by Oates, seem also to bump up against reality. So Oates describes another problem of the old levels system: that it encouraged a sense that pupils had to be rushed from one level to the next. “The whole of the system has been focused on getting kids to move quickly through the levels,” he says in the video. However, again, pushing children on to “tougher” material earlier seems to have been exactly ministers’ thinking in introducing the new national curriculum. And that thinking is reflected in what the new curriculum says. For example, in maths, pupils are supposed to be progressing through the manipulation of fractions at a younger age than they used to, are to be taught their 12x tables in year four as opposed to knowing up to 10x tables by year six in the old system, and now to be using square and cube numbers during year five. And yet here we are, with the new curriculum and assessment regime seemingly being billed enthusiastically by the politicians overseeing the system as pushing children on to more challenging material earlier (as shown here and here). Finally, Oates talked about the new national curriculum building deep conceptual understanding and focusing on “fewer things in greater depth”. The notion of stripped-down content seems largely true in subjects other than English, maths and science. But the new performance descriptors hardly suggest subjects concentrating on a few essentials. Indeed, the question as to whether this new curriculum really moves away from the tick-box approach which is widely thought to have troubled its predecessor and its associated assessment seems very real, when one considers the new performance descriptors. Prompted by the advice of a very experienced assessment expert, I noted that, for a KS1 teacher assessing whether or not a pupil is at national standard level across reading, writing, maths and science, there are 129 assessment bullet points to work through. At KS2, the equivalent figure is 144 bullet points. There is one final point to make about the performance descriptors: we still seem in the dark about who exactly wrote the consultation document. So, if people are unhappy with this outcome, who can we hold to account for it, or at least explain it? Criticism of the lack of transparency around the development of this new curriculum has dogged it throughout. Sadly, that is just one aspect of the dysfunctionality around policy-making that this national curriculum review, 2010-14, has exposed so vividly. Warwick Mansell is a freelance journalist and author of ‘Education by Numbers: the tyranny of testing’ (Methuen, 2007). DfE’s consultation on its proposed performance descriptors ends on 18 December. For the descriptors and how to comment on them, click here. Before July 14, I was happy. OK, I’m lying, but who cares about the feelings of someone barely out of NQT nappies? Certainly not the education politicians who can break teachers with a brisk sweep of a policy brush – ‘Heh, let’s abolish levels!’ ‘Tell you what, let’s assess all subjects … all the time!’ (Pause for righteous fear and loathing.) Yet, though the powers-that-be are not remotely interested in the content of my opening sentence, they are interested in its grammar. They care about my use of the word ‘before’. I then read the accompanying question: which of the sentences uses the word ‘before’ as a preposition and which as a subordinating conjunction? Hmm. Tricky. First, I had to put aside any normal thoughts such as train tickets are actually more expensive before 9am. And isn’t it better to brush your teeth after breakfast? Never mind the human drama that lurked behind the decision to leave the cinema early. Spilled popcorn? Spilled tears? The sight of a lover with a rival… Stop! In that BG (Before Gove) era, the explicit teaching of grammar was regarded as harmful. Young imaginations risked being cabined, cribbed, confined. Young minds would be pained by concepts too abstruse for them to grasp. No longer. The question on the use of the word ‘before’ appears in the sample Grammar, Spelling and Punctuation test, published on July 14, and intended to be taken by Year 6s in 2016. Hedged about by caveats and disclaimers, this test is nevertheless the only concrete example of the ordeal that awaits the current Year 5s – and their teachers. Remember, the 2016 test is going to be Much Harder (ungrammatical use of capital letters for emphasis) than its three predecessors as it is the first to be based on Mr Gove’s new primary English curriculum – the one which devotes 15 more pages to spelling and grammar appendices than it does to actual aims and content. The sample test does include a little story, no doubt a sop for those who pleaded for grammar to be taught in context. What a shame it is a pitiful non-story about a squirrel in a park notable only for an unnaturally large number of semi-colons and colons. Helpful hints for teachers also appear. One reads ‘this question assesses the ability to transform given verb stems into the past progressive form, and understanding of the term.’ Clear as mud is the simile that springs to mind. Don’t the powers-that-be realise that some children in Year 6 struggle to remember their full stops and capital letters? Shocking maybe, but true. Gove’s decision, back in 2012, to impose a formal grammar test on Year 6 children was hotly debated at the time. The NUT and the NAHT talked of a boycott. Michael Rosen argued powerfully that this pernickety, ‘there-is-a-right-answer’ approach to grammar was wrong-headed in linguistic terms. He also warned that it was yet another mechanism to control schools and would add to the ‘army of passive, failed people’ needed to keep wages down. Even the government’s own advisers warned against it. So of course in 2013 the Spag test, based on the old curriculum, went ahead. Now the protests have faded – or at least so it seems to me. Occasionally last year, I would look up from my marking/assessment/lesson planning/resource hunting/display mounting/behaviour managing/weeping to wonder why no one was shouting any more that teaching young children about fronted adverbials was not going to help them read, write or function as human beings FULL STOP. Instead, there are now numerous education resources and organisations promising to help teachers with their modal verbs and relative clauses. The message seems to be, ‘No one really believes in teaching this stuff, but here’s a way to do it.’ But if no one believes in teaching it, perhaps – radical thought here – it shouldn’t be taught. What a shame teachers are not permitted, in accordance with CPRT principles, ‘to exercise the responsible and informed autonomy that is the mark of a mature profession’. After all, as the final report of the Cambridge Primary Review pointed out, ‘the goal of literacy must be more than just functional’. Literacy should confer the skill ‘not just to read and write but to make these processes genuinely transformative, exciting children’s imagination, extending their boundaries and enabling them to contemplate lives and worlds possible as well as actual’. I did extend some boundaries this summer. Sadly I was not planning literacy lessons rich with talk of how to write wondrous stories, whimsical poems and powerful letters to politicians. Instead, I was shamefully and secretly working on my grammar. My time could have been so much better spent – and so could the children’s. Let’s ditch the grammar test before* it is too late. * subordinating conjunction or preposition? You decide. Stephanie Northen is a teacher and journalist. She was one of the authors of the Cambridge Primary Review final report. Sustainability and Environmental Education (SEEd) is currently campaigning to have the 2002 Education Act amended to make education for sustainability an obligation on all schools, notwithstanding the fact that it has been excluded from the new National Curriculum. The Secretary of State has said that while she accepts the importance of sustainability it’s up to schools to decide what to do about it, if anything. This seems a somewhat feeble response from a government that in 2010 proudly billed itself ‘the greenest government ever’ . In this matter DfE appears to be out of step not just with its own rhetoric and groups like SEEd and the Cambridge Primary Review Trust – which lists sustainability and global citizenship among its eight educational priorities – but also the UN and OECD. UNESCO’s agenda for global education after 2015 will link education to sustainability, global citizenship and equity, while OECD is likely to include ‘global competence’ in the next international PISA tests. Since so much educational policy these days, including the new national curriculum, is PISA-driven, we wonder why this should be an exception. This autumn, as noted in an earlier blog, CPRT will be joining forces with other organisations to raise the educational profile of sustainable development and global understanding. Meanwhile, SEEd is seeking support for its own campaign. Numbed by the unrelenting horror of this summer’s news from Gaza, Israel, Syria, Iraq and South Sudan, and the heartrending images of children slaughtered, families shattered and ancient communities uprooted, we ask what on earth we in the West can do. With our historical awareness heightened by the current centenary of the 1914-18 war and what, in terms of the redrawing of national boundaries, it led to, we also recognise that the fate of countries such as these reaches back in part to political decisions taken, like it or not, in our name and as recently as 2003. So collectively we are implicated if not complicit. If, as H.G. Wells warned soon after the 1918 armistice, history is a race between education and catastrophe, we must surely ask at this time why, for so many, that race has been lost; and whether and how education can do better. If ever we needed a reminder that true education must pursue goals and standards that go well beyond the narrow confines of what is tested, here it is. We know that England’s new national curriculum mandates what DfE deems ‘essential knowledge’ in the ‘core subjects’ (the quotes remind us that these are political formulations rather than moral absolutes) plus, in the interests of ‘breadth and balance’ (ditto) a few other subjects of which much less is said and demanded. But we’ve also been told that the school curriculum is more than the national curriculum. We should therefore take this opportunity to think no less seriously about what is not required than about what is. One of my keenest memories of the period 2006-9 when the Cambridge Primary Review was collecting and analysing evidence on the condition and future of English primary education is of visiting an urban Lancashire primary school that exemplified England’s ethnic, linguistic and religious diversity. We were there as part of a journey crisscrossing the country to take ‘community soundings‘ – a few days earlier we had been with Roma and Travellers in Cornwall – and having heard from children, teachers, heads, parents and local officials we found ourselves in a small room discussing faith, education and social cohesion with an imam, a rabbi and a priest. What was illuminating about this encounter, apart from the manifest respect each religious representative had for the other, was the extent of common ground between them. Predating by several years the current DfE consultation on ‘British values‘, our three faith leaders readily identified a moral core for education to which they and we could all subscribe. Significantly, this did not merely look inwards at Britain and to cosy clichés like fair play but unflinchingly outwards to the fractured and despairing world we see daily on our television screens. Yet where is any of this reflected in the national curriculum that England’s schools are about to implement? The exploration of faith and belief (which is not necessarily the same as compulsory RE) remains anomalously outside the walls, even as religion is invoked to justify unspeakable atrocities. World history receives scant treatment, the ethical dimension of science has been removed, culture – however one defines it – gets short shrift and in the primary phase citizenship has disappeared completely. For the society and world in which our children are growing up is this an adequate preparation? Some of us think not, and this autumn CPRT hopes to join with other organisations to explore curriculum futures which engage more directly and meaningfully with that world, believing that citizenship education is not only more urgent now than ever but that it must be local and global as well as national. So when schools consider how they should fill the gap between the new national curriculum and the school curriculum they may care to start by reflecting on another gap: between the curriculum as officially prescribed and the condition and needs of the community, society and world in which our children are growing up. So in the global race between education and catastrophe what exactly should England’s primary teachers do and what should England’s primary children learn? The question is entirely open: please respond. A detailed discussion, informed by extensive evidence, of the wider purposes of primary education and what these imply for the curriculum appears in ‘Children, their World, their Education: final report and recommendations of the Cambridge Primary Review‘, chapters 12 and 14. To contribute to the DfE consultation on promoting British values in independent schools, academies and free schools, which closes on the 18 August, click here. Information about CPRT’s coming global citizenship work with other organisations will be posted shortly.